People should have their ears pierced by a professional. A sterile technique should be used to pierce ears. Piercing guns should not be used. The Association of Professional Piercers (APP) recommends against using piercing guns. They can damage the ear. They can also carry body fluids from prior use. Professional piercing salons have after-piercing care instructions. They should be followed for the whole healing time of the piercing. Some risks of ear piercing are allergic reaction, scarring, and infection. About 30% of people who have their ears pierced will have minor problems. These most often happen in the first few days or weeks after piercing. Contact dermatitis: contact dermatitis is an allergic skin reaction. It is fairly common. It is most often caused by nickel. Nickel may be in some piercing jewelry. Piercings should be made of hypoallergenic metal. Types of these metals are stainless steel, titanium, platinum, palladium, and niobium. Titanium has the least risk of allergic reaction. Avoid gold posts right after a piercing. Even high quality gold can contain trace amounts of nickel. Embedded clasp: the backing (clasp, ball) gets stuck under the skin. The most common cause is that the earring post is too short. The clasp may also be on too tight. A visit to the doctor is often needed to remove the clasp. Local infection: about 10-30% of people may get a minor infection at the piercing site. This can happen even when the piercing is sterile and done by professionals. Symptoms include yellow discharge, crusting, or mild irritation. Traumatic injury: the skin around the ear can tear or rip. The earring may get hooked on a piece of clothing. This most often happens to the ear lobe. Auricular chondritis: a serious infection of the ear cartilage. This is the folded skin on the outer ear. 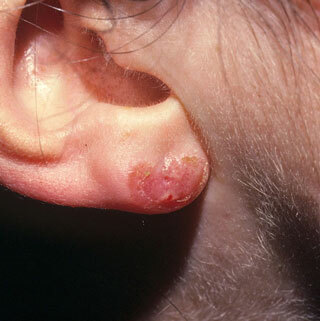 The infection can begin weeks after an ear piercing. It most often needs IV antibiotics. Blood-borne infections - Hepatitis B and C: these viruses can spread by sharing earrings. They also spread through use of dirty piercing needles. Professional piercing salons follow strict cleaning guidelines and use sterile single-use piercing needles. Cellulitis: cellulitis is the medical term for skin infection. This can happen if infection at a piercing site spreads into nearby skin. Symptoms are spreading redness and pain. Treatment with an antibiotic cream or pills is needed. Keloid: this is a term for heavy scarring at a piercing (wound) site. It develops over months. It happens because some people scar more than others. It is not because of how the piercing was done. Using ear piercing equipment that is not sterile can cause an infection. Using earrings with dirty posts can cause infection. Touching the earlobes with dirty hands may also cause infection. Another common cause is earrings that are too tight. The post may be too short or the clasp put on too tight. Tight earrings don't let air enter the piercing hole through the earlobe. The pressure from tight earrings also reduces blood flow to the earlobe. This increases the chance of infection. Often, this can be prevented by keeping the clasp farther from the ear. Some earrings have rough areas on the posts that scratch the piercing hole. This can result in infection. Heavy earrings can cause breaks in the skin lining the piercing hole. lnserting the post at the wrong angle also can scratch the piercing hole. A mirror should be used until the post can be inserted without trouble. Posts with nickel in them can cause an itchy, allergic reaction. Professional piercing salons have after-piercing care instructions. You should follow these for the whole healing time of the piercing. The most important thing to do is to keep the piercing site clean. You should also use an antibiotic ointment. You can treat a minor infection of a piercing site at home. Leave the earring in at all times. If you take it out, the hole can close. This can sometimes happen within a few minutes. Posts should be surgical steel, 14-18 karat gold, or metal like titanium. Some piercing salons recommend you do not wear gold posts right after a piercing. Even high quality gold can contain trace amounts of nickel. Make certain that phones are clean. Be careful when brushing your hair. Change and use a clean pillow case every 2 days. Avoid playing with the earring. Avoid smoking while it heals. Avoid wearing heavy, large, or dangling earrings. Avoid hanging anything from piercing until it is healed. Change and use a clean pillowcase every 2 days. Step 1: Wash your hands with soap and water before touching your ears. Step 2: Soak the area in warm salt water 3 times per day for 5-10 minutes. Put a salt water-soaked cotton ball right on the piercing. Step 3: Wash the piercing site 3 times a day. Use a cotton swab (Q-Tip) dipped in an ear care antiseptic solution. These usually contain benzalkonium chloride. If you do not have an antiseptic, use a tiny amount of liquid antibacterial soap (Dial). Make sure to rinse the soap off all the way. Step 4: Gently pat area dry using clean gauze or a tissue. Put a small amount of antibiotic cream on the piercing site 3 times per day. Use Bacitracin ointment (sold over-the-counter in the United States) or Polysporin ointment (sold OTC in Canada). You can also use one that you already have. Rotate (turn) the earring a few times a day. This will stop the skin from sticking to the post. With proper care, most minor infections should clear up in a couple days. If it does not get better within 3 days, you should see a doctor. If the infection gets worse, you should see a doctor. Put ½ teaspoon of non-iodized salt into a cup (8 oz. or 240 mL) of warm water. You can use sea salt to make the salt solution. Stir the water until the salt dissolves. Put direct pressure on the area from both sides of the ear. The best way to do this is to squeeze with your thumb and index finger. Use gauze or a clean cloth. Call you doctor if the bleeding does not stop after 10 minutes. Tetanus Shot: If your last tetanus shot was more than 10 years ago, you need a booster. Posts should be surgical steel, 14-18 karat gold, or a metal like titanium. Some piercing salons recommend you do not wear gold posts right after a piercing. Even high quality gold can contain trace amounts of nickel. Step 2: Soak the area in warm salt water 3 times per day for 5-10 minutes. Put a salt-water soaked cotton ball right on the piercing. First 1-3 Days: There might be some mild bruising and mild swelling. The piercing site may also be tender to touch. There might be a few spots of blood at the piercing site. During Healing: You may note some itching at the site. You may note whitish-yellow fluid that is not pus. This fluid coats jewelry and forms a crust when it dries. After Healing: Sometimes jewelry will not move freely within the piercing tract. This is normal and you should not try to force the jewelry to move. If you forget to clean the piercing, you may have normal but slightly smelly secretions. You should clean the piercing daily. Healing - How Long Does It Take? A piercing heals from the outside in. It can look fine on the outside but not be healed on the inside. Professional piercing salons give you after piercing care instructions. They should be followed for the whole healing time. Healing times vary from person to person. The values below are averages.